Let's just start out saying, if you expected pictures and a description of our planned Roman Day, then I'm sorry but you will be disappointed. We did absolutely nothing school related this week unless you count flute lessons. The house projects, nervous cleaning, and relaxation after the last day of school left little time for anything else. We'll get our Roman Day in soon and Summer school will start next week. I also took very few pictures this week. Actually, almost none. I could show you pictures of my newly painted and redecorated master bathroom, but I didn't take them. I will say though, that I LOVE the color and sometimes go in there just to look at it. I think our bedroom will have to become the same serene purply blue. Fred thinks I'm goofy, but I honestly go in there to just be calm. It's also sparkly clean. Even the baseboards are freshly painted white. I so love the results of the new Lysol cleaner I found, but I'm not sure it's entirely safe as my eyes burned and breathing was difficult after only two sprays into the tub with the exhaust fan on. By the time I was done I had nearly passed out twice. Still, it makes me happy to just look around in my bathroom. More Renaissance Faery. She's even got her Ren Faire shirt & medallion with a pouch of "faery dust" that she made. Her imagination is astounding at times. This is how she cleaned house much of the weekend. So there was good and bad in Amber's food this week. Let's just dive into the bad. She can't eat soy. I didn't even suspect it until recently. It is one of those dumb-mother moments too. A month or so ago I got lazy and we were out of homemade crackers. I checked the ingredients in Glutino Table Crackers and all seemed fine. They use soy flour and soy lecthin, but nothing that should trigger a FM reaction. Amber LOVED the crackers, so I kept buying them and put off making more Sorghum Teff Thins. Unfortunately, Amber had reaction after reaction and I couldn't figure out the trigger. She ate crackers during the week, but not the weekend and I simply was not even considering the crackers. Finally, something clicked in my brain when she had a Sunday reaction after eating crackers that day. We did a formal trial and sure enough she failed. Researching soy reactions and thinking back to when she was a baby on soy formula (because she was allergic to milk), I realized that the child has always done poorly with soy. I guess we never let her have foods with enough soy in it to make a difference until those crackers. 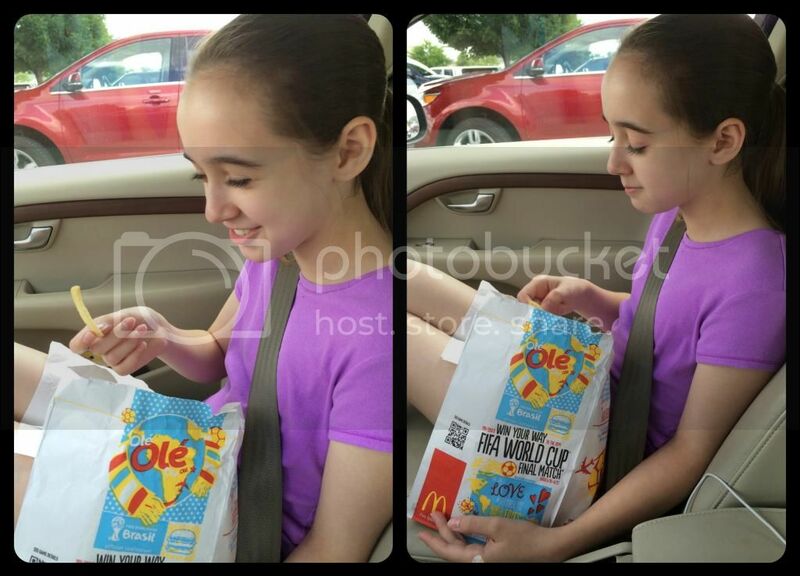 The good is that I let Amber try McDonald's french fries. I had tried them last Sunday with no reaction so we know the wheat content is minimal. I let Amber try them on Tuesday and she did great. Well, I assume she did. She was at the tail end of the soy reaction so I can't say she did not react at all, but it wasn't noticeable through the soy reaction. We will try them again soon when she is feeling all the way better, just to be sure. Amber was giddy to try a fry and then savored each one. We tried them while out running errands just like the old days with a special snack while out doing mundane tasks. I did try several new recipes this week with some success. The best of the bunch are the gluten free, low FODMAP buttermilk biscuits that actually taste like buttermilk biscuits (but no pics). They are so flaky too. Fred says they are good (which is a miracle in itself), but he doesn't think they taste like a buttermilk biscuit. Amber and I disagree. We win. The dough is so versatile too. It can be used for doughnuts and pot pies easily. I even ordered a new Cuisinart deep fryer so that I have more options for Amber. I simply do not fry food, but for Amber I will. She needs more variety and desperately needs to gain more weight. I changed up the cinnamon muffin recipe a little too and Amber liked it, but said she prefers the old one. I also adjusted my standard multigrain GF flour blend. Less sorghum flour (from 30% to 15%), more white rice flour (from 30% to 32%). Baked goods were a little too dense with the extra sorghum flour. The blend also contains millet flour (15%), potato starch (15%), potato flour (5%), and tapioca starch (15%). I don't mix the xanthan gum (3%) with it until baking time. Some recipes don't use any gums and I prefer to not remix my flour every time I need a gumless flour blend. We survived the first home visit for our home study process. We have the second of three visits this coming week. It wasn't painful or even stressful. Our social worker is a lovely young lady and very knowledgeable. I'm glad she is here to guide us through the process and be a resource for us after we bring home our new daughter. Amber was so adorable too. At the social worker's request, Amber gave her the tour of our house while Fred and I completed some (more) paperwork. I could hear Amber chattering away during the tour. It is enlightening to hear what your child thinks are important aspects to note about your home and what she glosses over as "just there". We also have done our first set of fingerprinting for the adoption. I had no clue they no longer used ink and used scanners now. Yes, it is pretty obvious that we have that technology; it's just that the word "fingerprinting" evokes the images of dirty smudges and messy hands in my mind. I was pleasantly surprised that we didn't even have to go to the police station to have it done. Overall, it was a good week for adoption progress. I know we like our 6 week on, 1 week off schedule for school. It works for us. However, this year our co-op will be doing a 7 week on, 1 week off schedule and it starts after we are scheduled to start school. I'm not sure how this is all going to work for us. Additionally, we will probably need to take time off to bring home a new child during the coming school year. I am not even going to pretend that Amber will get much school done while Fred and I are out of the country. Yes, she will probably do some school work just so that my mom has a break for a little bit each day. Or maybe they will spend the whole week prepping our house for the arrival. Even with all of this, I'm re-evaluating starting at the beginning of August. It was a long school year. Very long. Amber was sick a lot and I don't know if June and July will be enough time to recuperate while also completing the tasks we need so that our home is ready for another child. So, I'm currently planning and plotting what start date will allow us enough time off during the school year for holidays, adoption travel, rests, and sick days while also giving us the largest summer break. I think we may still have to start back in early August, but perhaps just half days. 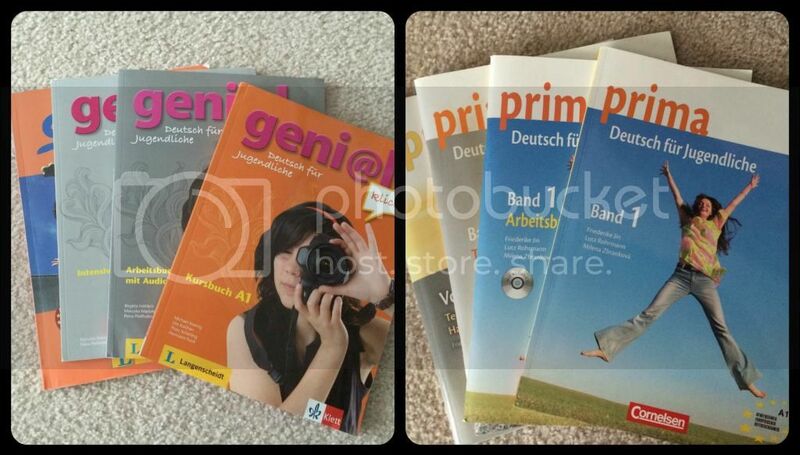 Which German curriculum to use? I think I like the one on the left better. However, it is very cost prohibitive to order it from the US publisher for a single student or a small co-op. I ordered it for literally half cost from Amazon.de. Unfortunately, the quantities available and shipping time make it difficult to use that for the co-op German class. I think I might be using the Prima (right) for co-op and the geni@l (left) as Amber's primary with prima as filler. I did, obviously, survive my colonoscopy and enjoyed my lunch out with Fred and Amber last Friday. The GI doctor found only one polyp in there this time. Yippie. Pathology is back and it was benign just like the others. No surprise there. It was a pretty small polyp too. There's no need for me to move to every three year colonoscopies; I'm good at every five still. Whew. I'm just one of those people who gets colon polyps, but there doesn't seem to be any issue with them. Today Amber has a friend over to play, hangout, and generally goof off with. She needs this after all the work she put in to get ready for home visits. Next week is Fred's birthday, a dietician visit, another adoption home visit, and possibly another day with a friend. There's no lazy summer days here, at least not yet. Sorry about the soy reaction but so very glad that everything else this week seemed to go well. I'm happy to hear that you are healthy and don't have to up the 5 year tests to 3 years. My son was odd as a baby with lactose issues that would not quit, he then had soy issues, we finally found a formula (at the time only made ready to use and high cost) that had prebroken down enzymes in it. It then took about six years after he was off of formula of a mix of 1% cows milk, soy milk, and water in equal parts until he was finally able to digest small amounts of regular lactose. We still have to limit them but now he can digest soy easily. I cannot imagine all the food limitations you're dealing with and food trials. Bless you for it! Those chemical cleaners always give me a splitting headache. I mostly clean with vinegar now. I like that image of Amber and the fries. That is one happy girl savouring her fries. I am glad that the home visit went well. I have been fingerprinted twice in my life both times to eliminate my (the employee) fingerprints from a crime scene. They have a great cream to get the ink off afterwords. I am largely turning Philip's school planning over to him. After the portfolio’s are done I have two weeks technically left, his assignment is going to be to come up with a plan. I'm glad she got to eat the french fries! Who would have known?? The color of your bathroom sounds LOVELY!! I'm with Chris, those cleaners give me a headache too. I just get so angry that all natural cleaners are so much more expensive. Just like organic food. I hope you all enjoy your break and I am beyond excited for you, Fred and Amber about the adoption. So glad to hear your doctor's visit went well. I LOVE Amber's wings and shirt. :) Happy weekend Christy. Hugs to you and your girl. So sorry about the soy problem. So happy your colonoscopy was good anout that you survived your first home visit! Do you have an idea of when your new child will actually be joining your family? It must be so hard to wait! Your new bathroom sound divine! Try to get some pics up! I love the picture of your daughter eating the fries. She really is savouring every bite! Fries - HUZZAH! 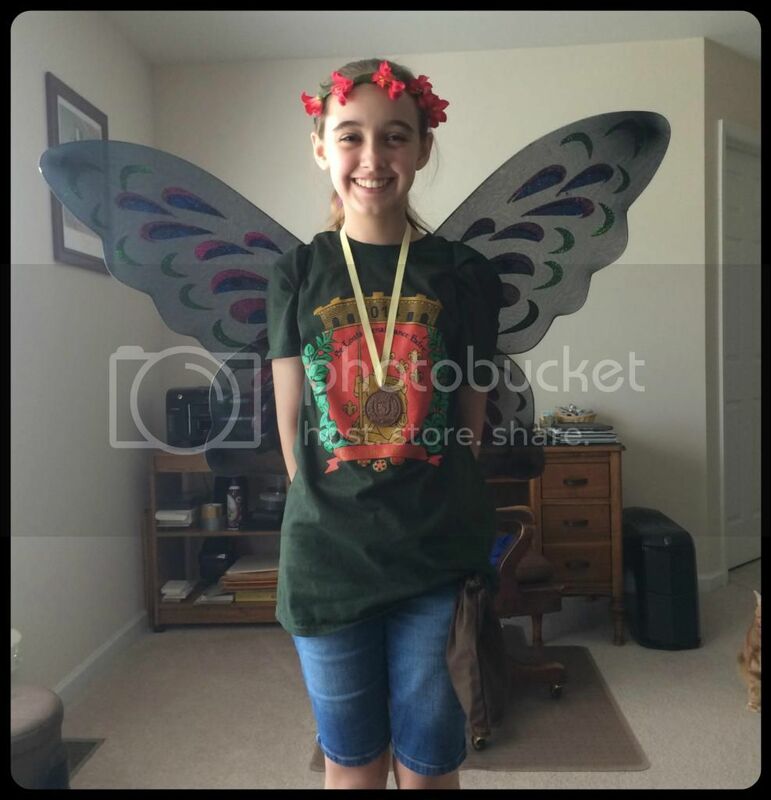 Love the fairy costume - nice job! Adoption - so exciting...a new chapter has started to emerge in your life and I am so happy for you all! Enjoy the summer months!